↑ Partido Unido de la Revolución Socialista de Cuba, aka PURSC. ↑ "ਮਾਰਕਸਵਾਦੀ ਆਗੂ ਦਾ ਜੀਵਨ ਤੇ ਵਿਚਾਰਧਾਰਾ". Punjabi Tribune Online (in ਹਿੰਦੀ). 2019-03-31. Retrieved 2019-04-01. 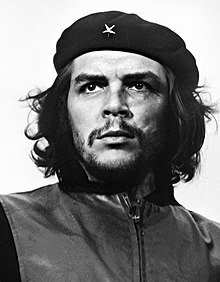 ↑ 5.0 5.1 On Revolutionary Medicine Speech by Che Guevara to the Cuban Militia on August 19, 1960. "Because of the circumstances in which I traveled, first as a student and later as a doctor, I came into close contact with poverty, hunger and disease; with the inability to treat a child because of lack of money; with the stupefaction provoked by the continual hunger and punishment, to the point that a father can accept the loss of a son as an unimportant accident, as occurs often in the downtrodden classes of our American homeland. And I began to realize at that time that there were things that were almost as important to me as becoming a famous or making a significant contribution to medical science: I wanted to help those people." ↑ Beaubien, NPR Audio Report, 2009, 00:09–00:13.